OXFORD, Miss. – For Shawnboda Mead, her passion for working on diversity, inclusion and cross-cultural engagement efforts in higher education began during her undergraduate college experience and continued during her graduate school years. In the case of Cade Smith, his dedication for driving social change and inspiring independent, self-sufficient and successful students is a product of time and place as a public school student in 1970s and 1980s Mississippi. The two will further explore those passions and dedications as new hires in the Division of Diversity and Community Engagement at the University of Mississippi. Mead is the new assistant vice chancellor for diversity within the division, and Smith is the division’s new assistant vice chancellor for community engagement. 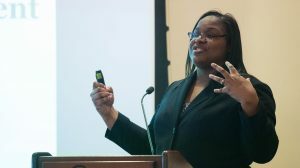 “The mission of the Division of Diversity and Community Engagement is to lead UM’s efforts to create a diverse, equitable and inclusive educational environment for all members of the community and to advance community-engaged scholarship, learning and service across the institution,” said Katrina Caldwell, the university’s vice chancellor for diversity and community engagement. “The role of the assistant vice chancellors is to assist in developing the infrastructure, vision and strategic frameworks for the campuswide integration of diversity and community engagement initiatives. Both Mead and Smith bring experience in creating building programs that positively affect the community, Caldwell said. Mead started her new job Sept. 10 but joined UM in July 2014 as inaugural director of the Center for Inclusion and Cross Cultural Engagement. While there, she oversaw the rebranding of the Bias Incident Response Team and development of an online reporting mechanism; expanded the Mississippi Outreach to Scholastic Talent, or MOST, Conference, while developing the MOST Mentoring Program and Reunion; and created a variety of diversity and inclusion events, facilitated cultural competency workshops and presentations, and developed student leadership opportunities among other endeavors. A native of Prentiss, Mead earned her bachelor’s degree in educational psychology from Mississippi State University and her master’s in student affairs in higher education from Western Kentucky University. She is working on a doctorate in higher education administration at UM. Previously, Mead served as associate director of diversity and multicultural education at the University of Tennessee. She’s also worked as an assistant director in Residence Education and First-Year Experience at the University of Southern Mississippi and as a student development specialist at Texas A&M University. Mead is married to Neal Mead, Ole Miss assistant athletics director for event management. The couple has two children. Smith is a Grenada native who joined the UM administration Sept. 4. He came to the university from MSU, where he was assistant dean of students and director of student leadership and community engagement. He also served as chair of the MSU Community Engagement Committee, director of the Center for Community-Engaged Learning, director of leadership programs, director of Maroon Volunteer Center Programs and co-creator and director of the Mississippi Racial Equity Community of Practice. Before joining the MSU Division of Student Affairs, Smith was a research associate in the Department of Plant and Soil Sciences. Before that, he was a research specialist in the Department of Agronomy at the University of Arkansas. 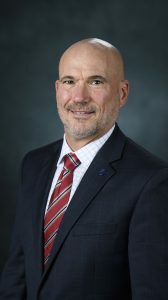 Smith said his agricultural background has been effective in his student affairs and community engagement work, as agriculture is an applied science with a systems approach, much like educational institutions and communities are systems. “Taking a systems approach allows me to be a more effective educator and a more effective administrator,” he said. “The curiosity of asking why is a fundamental basis of being a scientist. What am I seeing, why is it happening and what can I do about it? “Broadening people’s perspectives is a huge goal of mine, and it is really fundamental in creating a culture that appropriately contextualizes community engagement and then begins to track and assess community engagement and the impact that this institution has on our state, our nation and the globe,” he said. Smith is married to Becky Smith, director of the MSU Extension Center for Economic Education and Financial Literacy. The couple has five children.